A few weeks ago, I talked about How to Avoid Burnout. This week, I’m talking about feeling overwhelmed at any given point during the day. I have said this to you, so that in me you may have peace. In the world you face persecution. But take courage; I have conquered the world! (John 16:33). No one is promised a trouble-free existence. This is a fallen world. There will be problems twenty four hours a day. And that’s life – as soon as one issue is resolved, another one pops up in its place. I can’t promise you a carefree life without ever feeling overworked or overwhelmed. No one can. But, what I can offer you are some long-term techniques for managing stress, disorganization, and fear. As a pastor, leader, father, and husband, I’ve had to find ways to deal with all my commitments while still staying true to my family and loved ones. While apps, devices, software, and browser extensions can help you save time and get more organized, the real trick is INTENTIONALITY. You have to form new habits and actually employ the advice you are given. I’ve started the habit of arriving early to work and it has changed my life. I can get some quiet time to myself for prayer and preparation instead of walking into a situation already in the making. Just thirty extra minutes at the beginning of the day will do incredible things for you because you’re starting in a place of knowledge and preparation instead of stress and frustration. Schedule your day with enough time in between meetings and projects. Block off times for email and social media. This allows you time to breathe in between commitments and walk, not run, to your next engagement. So don’t schedule a phone call from 8:30 to 9:00 when you know you have a meeting at 9:00. Give yourself some unscheduled time in between meetings for catching up with other tasks, breathing, or simple preparation. Just like in the morning, it’s important to set aside time at the end of the day for calm reflection. You can free your mind for more creative work, make progress on a new skill, or tackle an unfinished task. Just remember, that you need time to decompress and reflect upon the day. Now, the only way this kind of stuff is going to happen is a word that I use very often—it’s INTENTIONALITY. Don’t believe the lie that your life is just too busy and complicated. Many of us have been in that habit for so long we believe it. But it’s not necessarily true. So, choose one of the three things above and apply it to your day. It’s a cliché, but “Just do it!” It can really have a huge impact on your life! 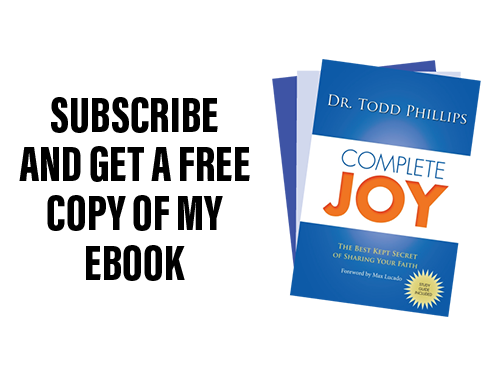 Hey this is Todd Phillips, you online pastor and personal life coach. I’ve got a question for you—have you ever felt overwhelmed? Now, look know the answer is yes, right, for everyone, unless we’re not being honest with ourselves. All of us have felt overwhelmed and this is different than burnout. A few weeks ago I talked about burnout – that’s a situation that’s permanent or at least it feels like it is. It’s overwhelming as I’m awake each day and as I go to bed at night and wake up the next morning, I’m feeling burnt out, I am burnt out. I’ve hit the cracking point. My foundation right has been cracked. This is different. This is feeling overwhelmed in the midst of our circumstances on a given day and all of us have felt that way. You may be sitting there right now watching this at some point and maybe you’re on break at work and you‘re thinking “I feel overwhelmed right now.” Well, if that’s the case, this is for you. I hope this is going to be a huge help to you as we take this journey together. Alright, so let’s talk about how to avoid feeling overwhelmed. 1. Start your day organized. Now, what do I mean by that? You know all of us have, I’m sure we have an outlook or we have a calendar on our phone, or on our computer. I’m talking about something a little bit different when I say start your day organized. This is time before the day begins that allows you to get ahead of those situations and those challenges that could cause you to feel overwhelmed if you’re not prepared for it. Now, emergencies still happen, but what I’m talking about is the idea of literally going into work each day a little bit early. This is one of the most incredible things that I ever did in my life. At 46, just about a year ago, I decided, you know what, “I’m not gonna show up at 8 o’clock, I’m gonna show up at 7:30, and then I decided to show up at 7:00. And let me tell you why I decided to do that. I was in a situation where I was walking into my office every day at 8 o’clock, and our office manager, the minute I walked in the door, she had 5 notes for me and somebody was on the phone for me at that moment. I couldn’t even put my computer down and plug it into the wall before I had to deal with about 75 different problems. And so I started the day overwhelmed. And then it kind of just stayed with me throughout the day and maybe you’ve felt that way before. Well, I started to come into work early. First, it was thirty minutes, because I love my sleep, right. So I decided, “Ok, I can suffer through thirty minutes, let me try this for a while.” And so for several months, I came in at 7:30 instead of 8:00. And it allowed me to look at my schedule. It allowed me to have a moment of quiet time and for me, as a Christ-follower, as a Christian, to spend some time in prayer with God, asking Him to help me prepare for the day. But even if you don’t believe in God, or you have questions about whether He exists, or you think I’m crazy for believing in Him. Listen, this stuff still works. Ok, it’s coming in early. That thirty minutes allowed me to prepare, to look at my calendar, to deal with what I knew and I found would be the problems of the day. Look, I can’t tell you how much this has changed my life in the last ten, twelve months, to the point of now I’m coming in at 7 o’clock. And that may sound crazy to you, and I get that. Sleep is a core value for me, right, so this was a major change in my life to make this decision. Because every moment after that alarm goes off is important. In fact, I’m a big snooze-button-pusher. But this has been so transformational for me and I hope it will be for you. And I’m not asking you to do it for an hour or two hours or anything like that, but those thirty minutes, those thirty minutes that you give yourself at the beginning of the day. Just thirty minutes will do incredible things for you as you go throughout the day, because you’re starting in a place of knowledge and preparation. You feel ahead of the game instead of working behind the eight ball and we all knows what that feels like. Not only do we start our day early and allow ourselves a block of time to prepare for the day so we don’t feel overwhelmed, number 2 is that we need to transition well from meeting to meeting, chapter to chapter throughout the day. This is a really important piece of not feeling overwhelmed throughout the day. Here’s the deal – a lot of us what we do is we smash together, it’s not even this, it’s this, right, we just smash together the meetings throughout the day. So, we start 8 o’clock in the morning, and we’ve got a meeting from 8 to 8:30, and then we smash and overlap that meeting, and we’re 5 minutes late from 8:30 to 9:00, and we’ve got a 9 to 11 o’clock presentation, and we mash that together with the meeting before and after, and then we try to pull a lunch in between that to go to the next meeting. You see what I’m talking about? For many of us, right? A lot of us are going through this. Every day this is how we live our lives. Mashing our meetings together. And here’s what happens when we do that. Let me explain it this way. Let’s talk about a stress meter. Alright, stress level 1, you’re calm, cool, and collected. Stress level 10, man you’re losing it, you’re about to go nuts. So from 1 to 10. This is how it normally happens for some of us, it certainly did in my life and I bet you’ll relate. But, let me get there in a moment. Let’s just talk about reality today, right. A lot of times, we’ll start with that first meeting, we run into the office, we’re already behind the eight ball. Alright, so our stress meter, the minute we get to the office, goes from 1 to 2. Alright, now we jump into that 8 o’clock meeting and we’re five minutes late to the 9 o’clock meeting, and while we were in the 8 o’clock meeting, we were thinking about the 9 o’clock meeting, and now, when we get to 9 and we weren’t done with 8, and we’re at a stress level 3. You see where I’m going with this. Throughout the day, our stress meter goes from 1 and it just continues to climb as we mash through those meetings, as we mash them together, and we don’t allow ourself a time to breathe. So by the end of the day, we’re at a 10. I mean, we’re just absolutely through the roof with stress and then we find ourselves trying to come down off this stress level 10 so that we can see our families thirty minutes later or an hour later when we drive home and be back at a 1 or a 2. And it’s next to impossible to go from a 10 to a 2 in half an hour, right. So then we go to bed frustrated that we haven’t spent time with our family, and we wake up the next day and we’re already at a 2 instead of a 1. And at day 3, we’re at a 3 instead of a 2. It’s a really vicious cycle and that’s what I want you to see. And if you’re going through that right now, I want you to hear this. There’s a better way to transition from meeting to meeting. This is what I do. First of all, I’ve block off times for my emails and this is something I’ve talked about in another video about feeling burnt out and you’ll want to watch that on the blog if you haven’t seen it. But this idea of blocking off times for emails throughout the day allows me to not always be trying to catch up with those emails between meetings. It allows me to focus in on what I’ve got in front of me and what I’ve got in my next meeting and allows me to be fully present in the moment. And I know this may sound silly, but this is what I do. When I’m in a meeting and I know I’ve got about five minutes left, if I’m in control of the meeting, and a lot of times, because I’m leading an organization, I have the gift of being in control of the meeting, I’ll be fully aware of my timeframe and allow myself just a few minutes, at least a few minutes, between that and my next meeting, to simply take ten deep breathes. To breathe in deeply, in and out. And even close my eyes and allow myself a moment, of for me, prayer. Just asking God to prepare me for the next moment. And then I walk into that next meeting, not running, but walking, prepared to engage fully with the creative insights, the experience, and the direction that God has given me, to apply all of that to that next meeting. So transitioning well from meeting to meeting is extremely important and if we don’t do that, we’ll find ourselves at a level 10. So what happens if you do it the way that I’m talking about? Well, it’s really incredible. So, let’s say you go to the first meeting, you’ve got a few minutes between them and the second meeting, and that first meeting was very stressful and you’re up at a 3. Take those deep breathes, spend some time in prayer, you’re able to get down to a 2 or a 1 to prepare for the next meeting. And then you may see some stress in that meeting, but you have another moment of time, of deep breath, and relaxation and prayer. And you come back down to a 1. So you’re doing this (~) throughout the day rather than doing this (/). And it changes everything. Not just your relationships at work, and your ability at work, right, to contribute, to engage, but also your relationships with your family when you get home. Because it’s a lot easier to go from a 3 to 1 then a 10 to a 1. So, think about that, transitioning well from meeting to meeting, and finally number 3. One of the best to stop from feeling overwhelmed is to start the day like we talked about before, that first thirty minutes, but also at the end of the day, to give yourself a small block of time to address the challenges, right. The things that were undone. If you know you’ve got a block of time, literally put in your schedule, you’ve got that block of time set aside. If you miss something at 11 o’clock or 1:30 in the afternoon, you can make a note to yourself that you’ll handle that during that protected block of time at the end of the day. Now, the only way this kind of stuff is going to happen is a word that I use very often—it’s INTENTIONALITY. There’s a difference between listening to this or watching this right now, and saying, “You know what, it would be really cool if I came in thirty minutes early, and I block off time for my emails, and I transition well from meeting to meeting, and I protected some time in my calendar at the end of the day, but my day is just to frenetic.” Don’t believe that lie! Many of us have been in that habit for so long we do believe it. But, it’s not necessarily true. Now, some of us are ER physicians, some of us are on call at different jobs. I know that there are some limitations to this, but if we’ll be intentional about trying to apply at least one of these things to our day, it will have profound, and I really believe this, life-altering impact on your career, and even your family, life, and sense of purpose. I mean I’m telling you, this can really have a huge impact on your life. So think about that and until we talk again, until we talk next time, LIVE PASSIONATELY, GIVE GENEROUSLY, and IMPACT THE WORLD FOR GOD. This entry was posted in Blog, Stress, Videos and tagged burnout, frustration, mature Christian, overwhelming, self help, stress, stress management, worry. Bookmark the permalink.